Hatters boss Nathan Jones admitted it was something of a mystery as to why striker Craig Mackail-Smith has struggled in front of goal so much this season. The 31-year-old was a wanted man in the summer after leaving Brighton & Hove Albion, but after agreeing to sign for Luton, has not yet reached the heights that saw him earn a big money move to the Amex back in 2011. 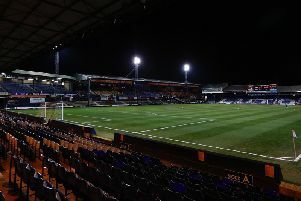 Mackail-Smith’s winner against Hartlepool on Saturday was just his fourth goal in 29 appearances for the Hatters, and a first since September 19. When asked about his lack of goals, Jones said: “That’s a puzzlement because he’s such a good player. He gets into situations through endeavour, through movement, through work-rate and he has to be a little bit more clinical, but he had one chance and I’m proud of him. “I thought he was going to put his foot through it or guide it into the bottom corner, but he showed a real cool head and at times that’s what we need to show. Mackail-Smith himself felt that he struggled at the beginning of the campaign due to the upheaval off the pitch, but hopes that he can enjoy a prolific run-in to the season. He said: “I hope so. The beginning of the season was a lot of change for me, having to move from Brighton relocate the family so there was a lot going on in that period. “Maybe I didn’t perform as best I could, and I got on myself expecting a lot more. I’ve moved now, relaxed and am settled so I can just take the pressure off, enjoy it and hopefully give the young lads a bit of experience, a bit of advice and hopefully take my own game on. “I’m happy to play upfront in a two, a one, out wide left or right, so’ll do a job for the team wherever. As long as I’m enjoying it, that’s the most important thing at the moment. Team-mate Danny Green was also thrilled for Mackail-Smith, as he said: “Some of us have found it quite hard this season to get some consistency going in our game, but he got his goal and I’m buzzing for him as he’s a really good finisher and a top man as well. “He works his socks off and he deserves it. He works hard in the gym and on the training field, sometimes you just don’t have any luck.